In the Bodywork/Somatic Psychology field, we say: "People hold their issues in their tissues." What this means is that our emotions are expressed through our bodies, because emotions are embodied energy. Take a moment to consider, when you experience tension, pain, or restricted movement in your body--outside of an accident/injury--isn't if often related to an emotionally charged situation in your life? Therapeutic Bodywork focuses on these areas of restriction and pain, assisting them to "unwind" or "release," allowing many people to experience less anxiety, less depression, and an overall sense of peace and integration. Therapeutic Bodywork/Somatic Psychology encompasses a wide area of practice. Most people are familiar with massage and its many benefits, both physical and psychological (stress reduction, etc.). What distinguishes Therapeutic Bodywork from massage is its approach to personal/psychological growth through increased body awareness, more deeply felt emotions, and the synchronizing of body, emotions, and spirit through the use of various body-mind modalities. It is Somatic Psychology. These somatoemotional benefits are the primary focus of Bodywork. Bodywork for trauma, personal growth and working through emotional issues is known by several different names (Somatic Psychology, Body-Mind Psychotherapy, Somatic Integration; Body Psychotherapy; Energy Psychology, etc.). There are now several graduate programs that offer training specifically in Somatic Psychology. One's sense of “Self” begins to form first as an infant and then as a toddler, through experiences of the body and senses (touch, taste, sight, hearing, smelling). Only later in life do we develop a vocabulary that allows us to put our experiences into words. At times, this results in people experiencing a difference or even a "split" between what they think and what they feel. People may say, “I know in my head that people love me, but I just don’t feel it!” Bodywork helps a person's feelings (felt sense) and thoughts (mind sense) come into closer alignment. This brings a person's felt self together to a new depth of personal integration. In humans, Touch is really our first language to develop, a way of communication. It is not difficult to see that "bad touch" communicates harm, injury and ill intent. Absence of touch often communicates neglect or lack of connection. Many people, due to trauma, have become "cut off" from their feelings. Therapeutic Bodywork can help people literally "get back in touch" with themselves, i.e. their feelings. In addition, Bodywork is a means to reverse the feelings of disconnection and disembodiment that are a byproduct of our very isolated and impersonal society. It is a way to experience deep nurturing, affirmation and care for the "True Self." On the positive side, "Good Touch" communicates care, concern, safety and connection. It has been said, that "To children,[good] touch is food." This is also true for adults--but is often less acknowledged in our Western culture & society. What will a session feel like/be like? Sessions are different for everyone. In the first session, most people feel relaxed, and experience a sense of deep quiet/find themselves reflecting on insights/ emotions they have experienced during the session. People may feel an increased level of energy, heightened awareness, and greater emotional freedom. 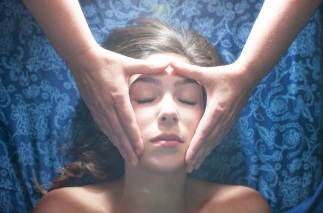 In following sessions, people may feel strong emotions and/or have powerful memories/images surface during bodywork. Bodywork can assist you to release and "let go" of blocked emotions/energy in your body. Because I am a licensed counselor, I am comfortable with you experiencing your emotions--and can work alongside your primary psychotherapist if you are currently in counseling. Some people request their counselor attend sessions and I am happy to accommodate you if you desire them to be present. ​What issues can be helped with Bodywork? Bodywork may be able to assist those who are working through issues in which the body has been impacted. Specific issues may include:trauma (physical, emotional, sexual), neglect, negative body image, touch deprivation, eating disorders, depression/ anxiety, self-injury, and shame. Research is showing the effectiveness of Bodywork in helping process through these issues. ​Can I do just Bodywork? In my clinical experience, I have discovered that people seem to benefit the most from Therapeutic Bodywork when they are also maintaining their regular course of psychotherapy. In fact, from my experience, a good ratio of psychotherapy and bodywork is 1:1 or even 2:1 (i.e. with psychotherapy being the primary treatment--bodywork being supplemental work). If you have never been in therapy, and would like to try Bodywork, I am happy to provide you with the names of several counselors in the area who would work alongside us and become part of your "growth team!" This is because I have found it to be in a client's best interest to serve as either their Bodyworker, or primary counselor (talk therapy)--not both. leaves a session feeling refreshed and relaxed--this may not be the case with a Bodywork session. This is why it is important to be engaged in your own counseling/growth process. (psychotherapy) to process your experience. Bodywork is work, but GOOD work!